Common pieces of leather furniture buyers add to their living rooms include arm chairs and sofas. Depending on the number of people living in the house, larger pieces like sectionals may be needed to seat everyone comfortably. Be sure to plan purchases according to seating needs, as well as available budget and space. There is great variation in price for similar products among manufacturers. Leather is graded in order to determine its value. However, there are no industry standards for this system. Because it's not uniform, it is important for individuals to know more about the characteristics that give value to leather, such as color treatments, textures, and durability. The types of color treatments or dyes that leather may be exposed to are aniline, semi-aniline, and pigmented. Aniline leather is treated with a transparent dye and therefore has the most natural look and feel. It is the least stain resistant and most expensive. Choose this leather if you expect light to moderate use of the furniture. Semi-aniline leather has been lightly dyed or stained to retain its natural characteristics. It is more stain resistant and less expensive than aniline. 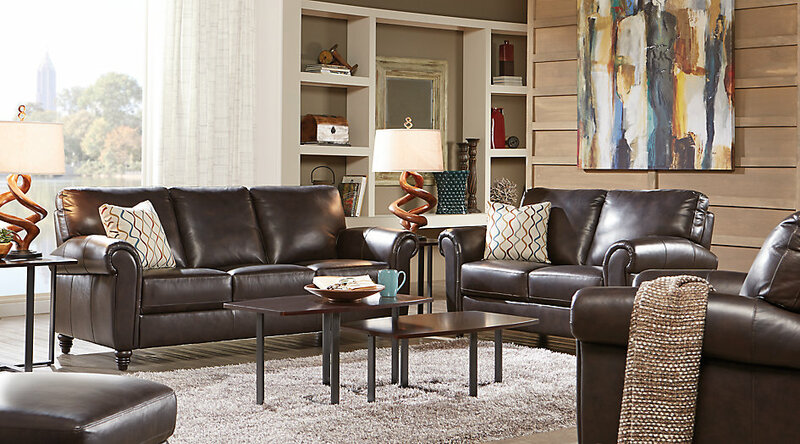 This is a great choice for people who regularly use their leather furniture. Pigmented leather is a stain and scuff resistant, budget-friendly option. This material has been buffed and treated, then stamped to give it the appearance of natural leather. The fabric is perfect for homes with children and pets. Leather hides come in top or split grains. Top grain hides are made from the very outside layer of the animal and are the most durable and expensive. Split leather is slightly lower quality. Top grain that has been sanded or buffed is referred to as nubuck. Split leather that has been through this process is called suede.